Photos provided by Barb Heiss, Kevin Slick, Pat Gonzalez, Ted Bohus, Steven & Maxine Wrzesien, Robert Taylor, The Smoot Family, Larry Ruggiero, Brian Horrorwitz, and others - thank you! 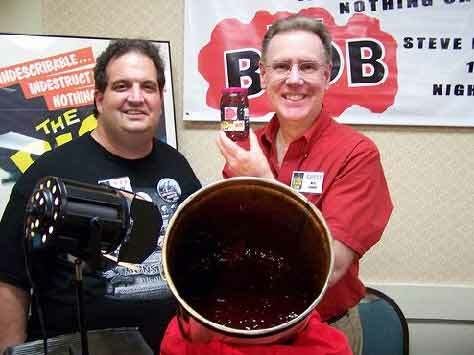 "Red Death" and Bash attendee and auctioneer Sam Borowski! 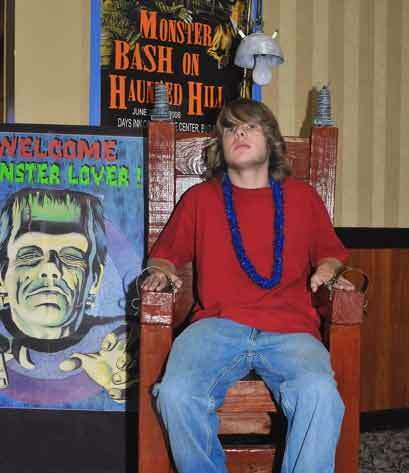 In our benefit auction for little boy Basher Noah Sheaffer's Miracle Fund, we raised $4,295! Go Sam, go! 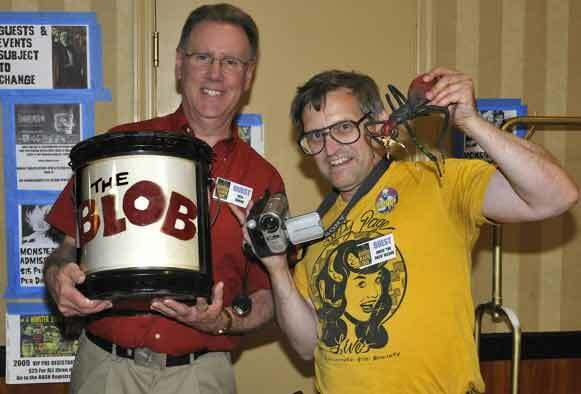 Bash attendee Robert Tullo presents Wes Shank (owner of "The Blob") with Blob Jelly! 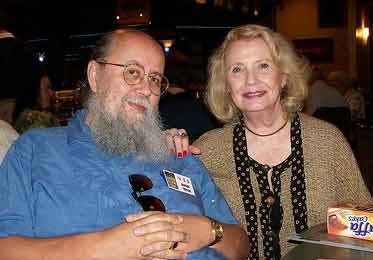 Bash attendee Robert Taylor hangs out with the lovely Elizabeth Shepherd. 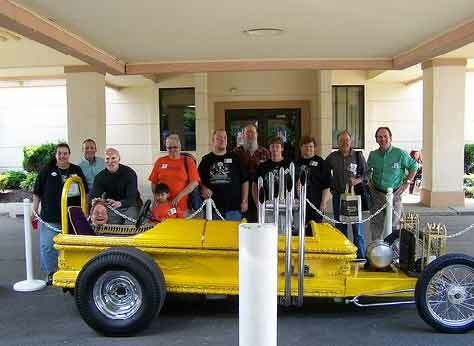 Thanks to Tony Grecko, the Drag-U-La made and appearance with a gaggle of Bashers! 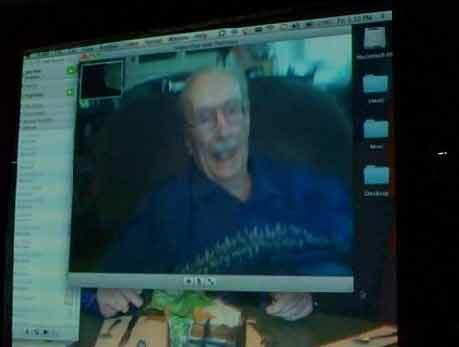 Following doctor's orders, Forrest J Ackerman couldn't physically make it to Bash....but we had LIVE Wi-Fi-Sci-Fi with Uncle Forry on the big screen. Remembering Vincent Price...it was VP co-stars Charles Herbert, Donnie Dunagan, and Elizabeth Shepherd! 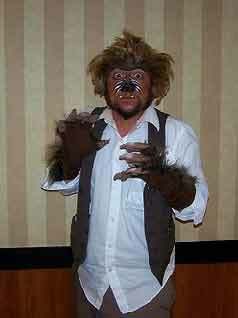 Garou from the Shilling Shockers TV Show was howling happy at Bash! 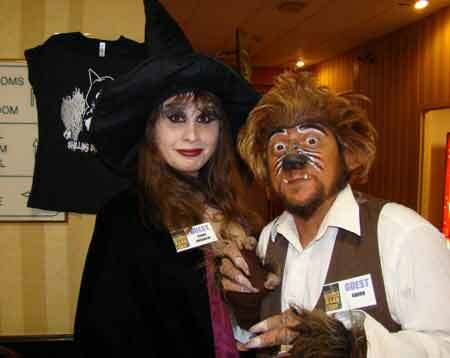 Penny Dreadful and Garou in the lobby! 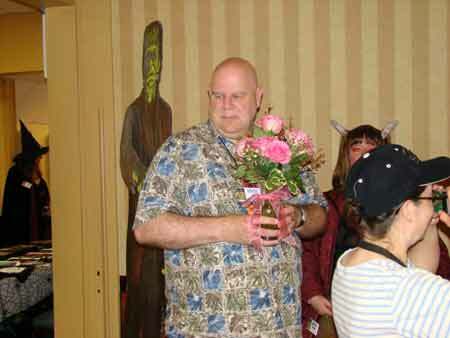 What a great picture of big comedian Don Reese...holding flowers! 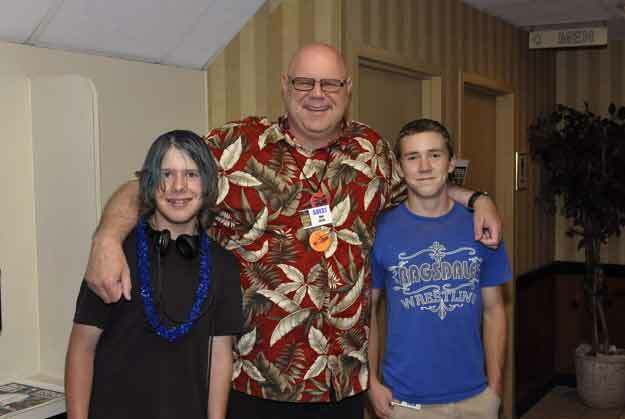 This submitted by the Smoot family: Dalton Smoot (left) told a grinning Dylan Culler (right) that "A giant came into my room and woke me up! And he wore a really loud shirt." 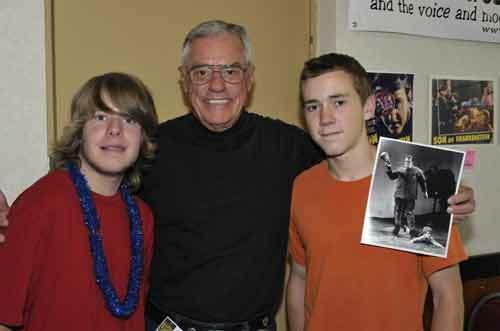 Donnie Dunagan (center) tells Dalton Smoot (left) and Dylan Culler (right) that a giant came into his room and woke him up, but his giant wore a really woolly shirt! Dalton Smoot finds a good place to rest after listening to one of the many dramatic monologues of David "The Rock" Nelson! 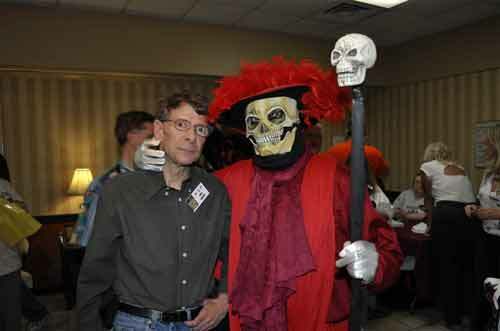 Maybe it's just the cool skull cane, but Phil Smoot is starting to feel like the guy in red takes a better picture. 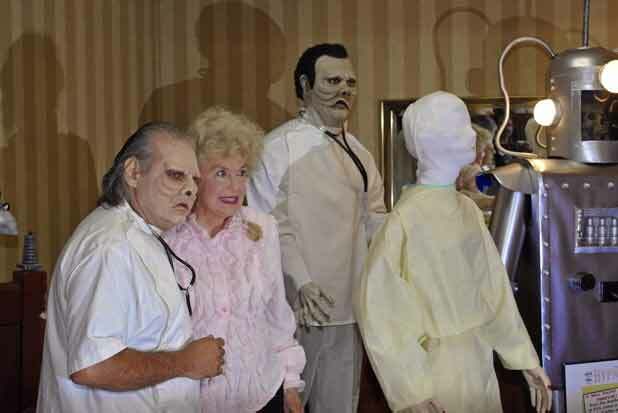 Donna Douglas finds that her eye beholds a deja vu from The Twilight Zone. 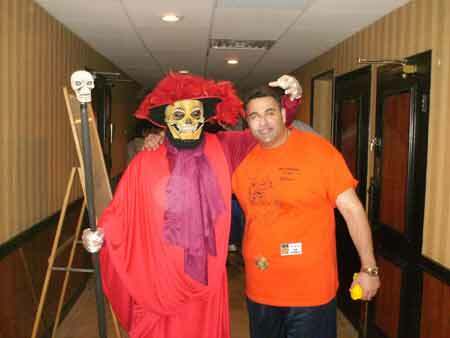 Ron Chamberlain, make-up artist on left. Figures by The Armellinos on Donna's right. Aztez Robot from Daniel Griffith. Suggesting that the can contains a lesser terror, there are those that would let The Blob loose and reseal it with The Rock inside! 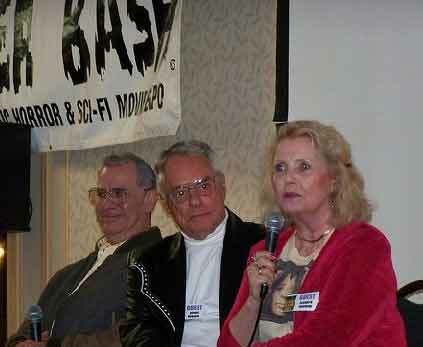 Behind registration, it's Bash volunteer staffers Kevin Slick, Ron Adams, Ursula Adams, and Jerry Armellino. 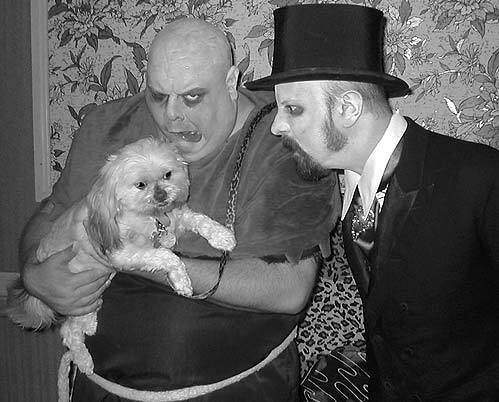 Ghoul A Go-Go Meets Bella! 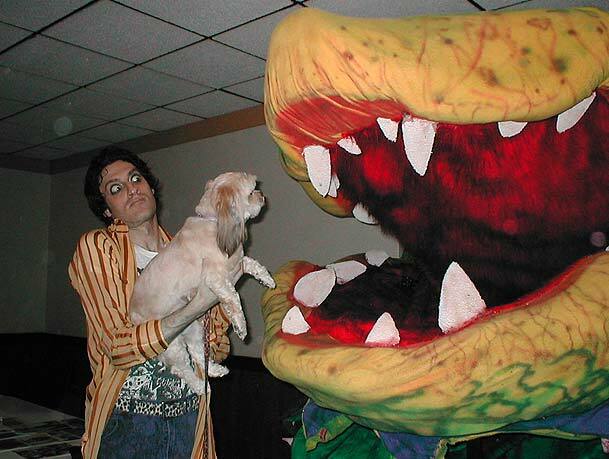 Bella is the little dog owned by Brian Horrorwitz of Trash Palace Video. 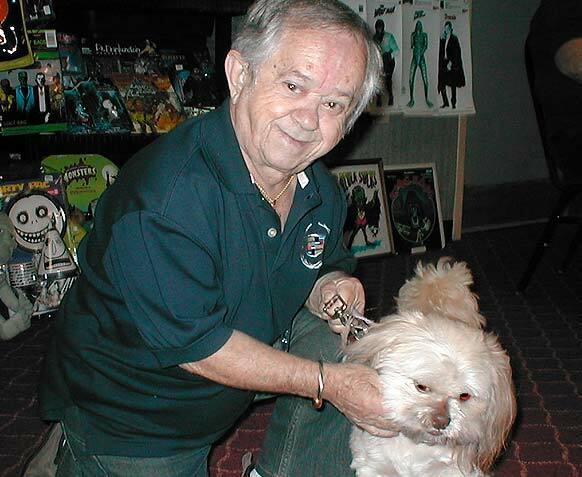 Bella makes the rounds...here with actor Felix Silla at Bash.